[WJE] Clover Crown Avatar Parts & More! ★ Here's what's included in this week's Weekly Jewels Extravaganza! ・Access to VIP Draws from Deals that have a VIP Draw! * If you purchase the Weekly Jewels Extravaganza on Sunday, the bonuses will only be available until 11:59 p.m. (PT) on that same Sunday. Draw Tickets can be used in the ongoing Ticket Draw! * The number of Draw Tickets obtained will be reset on Mar. 24, 2019 11:59 p.m. (PT) / Mar. 25, 2019 6:59 (UTC). Yellow indicates values when Medal is upgraded to Supernova+. [Target: All] 1 turn: SP ATK B +200% (+250%). * Damage multiplier listed applies to a version of the Medal with a maximum Special Attack Bonus. ★ Get the Baymax Snuggly avatar parts, P Boosters, and other rewards! Fight the Extra Hard Boss during Bonus Times for more coins! The following bonuses will be available each day during the times below! ・The chance of rare enemies appearing will be increased! ・The Extra Hard Boss will be harder to defeat and will yield bonus coins! Below are the Cross Boards available during the Event Period! * Magic Broom Set #2 and Magic Mirror Set #2 will unlock sequentially. Baymax Snuggly (Male) Chat Phrase: Genius! Baymax Snuggly (Female) Chat Phrase: There, there. The P Boosters from this event will temporarily strengthen your Power attribute Medals! * P Boosters obtained from this event will expire on Mar. 31, 2019 at 11:59 p.m. (PT) / Apr. 1, 2019 6:59 (UTC). ★ Fight alongside your party to defeat the Gear Golem in this Raid Boss Event! Defeat the Gear Golem Raid Boss with your party members to earn Raid Coins, which you can use to get fabulous rewards, including Magic Broom, Magic Mirror, Chip, and Dale Medals! The Raid Board for this Raid Event will be available until Mar. 25, 2019 11:59 a.m. (PT) / 18:59 (UTC). Upon successful defeat of the Gear Golem, the raid boss level will increase by 1. NOTE: When the Gear Golem appears, you will not be able to proceed in the latest main quest. On Monday through Friday, the Raid Boss will be available during the times listed below, and will cost a reduced AP amount of 5 AP to fight! * Outside of the above times, raid quests will cost 90 AP. On Saturday and Sunday, the Raid Boss will be available all day and will only cost 5 AP to fight, until the event ends on Mar. 24, 2019 11:59 p.m. (PT) / Mar. 25, 2019 6:59 (UTC)! Additionally, the following bonuses will be in effect between the times listed below! ・AP cost will be 0! ★ 3 NEW Tier 8 Medals have been added to the KH III Deal! Both Standard and VIP Draws offer 10 Limited VIP Coins per draw! The new Tier 8 Medals KH III Baymax, KH III Go Go, and KH III Hiro have been added, for a total of 28 KH III Medals available from the KH III Deal! Additionally, you'll get 10 Limited VIP Coins per draw from both Standard and VIP! See in-game for Deal Details! ・All 28 of the KH III Medals can be powered up with Dual Meow Wow Medals! ・Tier 9 Supernova Medals - Can be upgraded into Supernova+ Medals! ・Tier 8 Medals - Can be evolved into Supernova Medals! ・Tier 7 Medals - Can be evolved into Supernova Medals! ・Each Medal comes with 5 trait slots. ・Supernova - KH III Lea (Axel), SN - KH III Monster Sora and Supernova - KH III Vanitas are worth 180 Spirit Points. ・The remaining Tier 9 Medals and Tier 8 Medals are worth 120 Spirit Points. Tier 7 Medals are worth 80 Spirit Points. * Indicated Spirit Point values apply when the Medal does not have any traits unlocked. Evolving the Medal unlocks Supernova. [Target: Single] HP recovery LV 3. Gauge +15. Cures ailments. [Target: Single] 1 turn: ↑ PSM-STR 5. [Target: Single ] 1 turn: ↑ DEF 5, ↓ target's PSM-STR 5. Limited VIP Coins can be used to unlock rewards from the ongoing Limited VIP Boards! 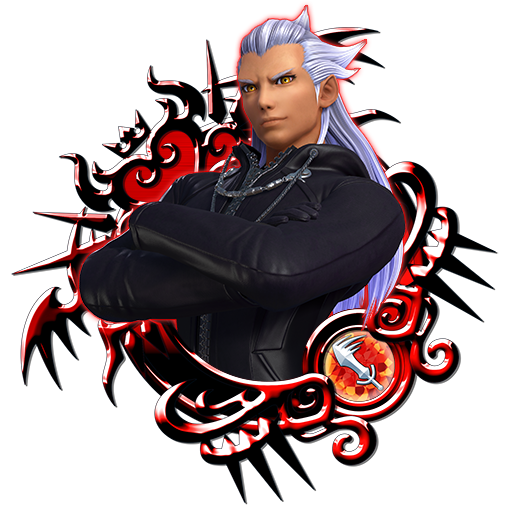 The rewards from current boards include Trait Medals for use with Supernova - KH III Riku, Supernova - KH III Sora, and SN - KH III Young Xehanort! * All Limited VIP Coins currently being distributed will expire on Mar. 31, 2019 11:59 p.m. (PT) / Apr. 1, 2019 6:59 (UTC). [Avatar] Hero Baymax & Hero Hiro Boards! 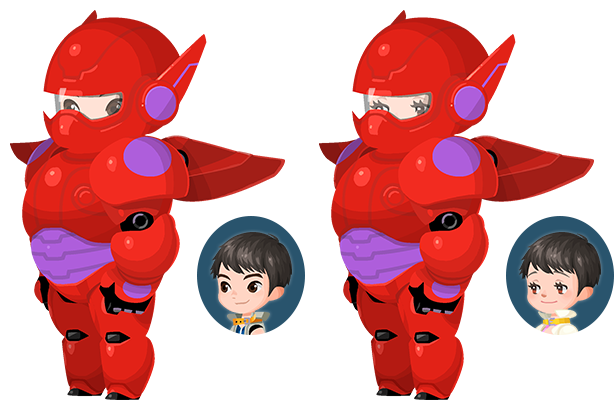 ★ The Big Hero 6-themed avatar boards are now available! Our latest boards feature the main protagonists of Big Hero 6! 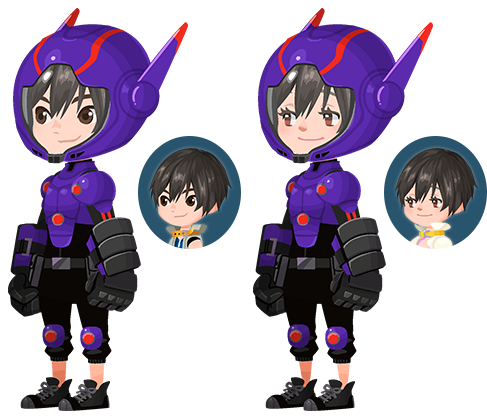 The Hero Baymax and Hero Hiro avatar boards are now available for 2500 Jewels apiece! Both boards include powerful NEW skills, check them out below! Deals 2.4 times more damage, and vastly increases Lux dropped by enemies. Has a 100% trigger rate at LV 20. Deals 2.8 times more damage, and increases attacks prizes dropped by enemies. ★ Strategize your way around various Special Attack limitations! These 6 event quests restrict your usage of Special Attacks! Complete objectives to get up to 48 Huey & Dewey & Louie Medals!